Hey, I finished another horror game! Crazy, right? 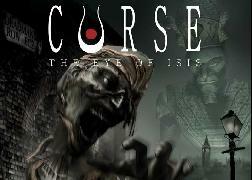 This time it is Curse: The Eye of Isis, a throughly mediocre game that nonetheless has some interesting ideas (that don’t work out, of course). This was one of the most pleasant bad games that I’ve played in a while because it’s not particularly buggy and I got a kick out of killing everything with the default club weapon. If I can finish a couple more games I can retire the original Xbox, which I’ve kept hooked up just for a few obscure titles like this one. Curse is actually a great game to study because it’s got all kinds of common failures wrapped up in one package. If you’re like me and you enjoy punishing yourself to learn things, it’s actually worth a look. Any thoughts on P.T. and the whole Silent Hills thing? I think it will probably make me break down and buy a PS4. AHAHAH yeah I played it long time ago… such awful game. Have you ever player Magatama? It’s a SH set in the woods, it seems great! I was actually really interested in playing this game. Some of the stuff seems interesting despite seemingly being flawed. But I am kinda like you in the sense that I do enjoy playing bad games (Especially survival horror) for the sake of learning and studying. However I don’t think I’ll ever be able to play this because I don’t think it’s available on american Ps2s. And I don’t have an xbox. I forget the details but a while back I know I gave up on being able to get this game for a reason. Thank you for posting about this. I certainly never heard about this game, and I loved how it went somewhat in depth. If I do ever make a horror game, I’ve definitely gonna remember this and try to do some more research on that game, even if it is just for knowing what not to do.